We were sitting at a low table in child-sized chairs outside of the classroom, the fluorescent lights above us flickering, as they always did. It irritated me, but it didn't seem to bother Jane, the first-grader who nervously tapped her foot by my side. It was my year of student teaching, and she was about to read to me from the leveled reader in her hands. It would be a challenge for her, I knew; she had been stuck on that reading level for quite some time, stumbling over the more complex words and staring blankly at sight words she had not been able to memorize. "The puppy goes for a walk," she read fluidly. Magic happened in those five minutes under the fluorescent lights. As I listened, I knew that I was witnessing a momentous step in her transition from non-reader to reader. I hung on her every word, engrossed in her hard work and overwhelmed with gratification at her success. That time out in the hallway with Jane made me certain of a simple fact: I would become an early elementary school teacher and I would dedicate myself to teaching children to read. Jane read her book, from start to finish, with only a minor stumble or two. But her decoding accuracy was not what stunned me. The thing that changed me forever was the expression that burst across her face after she spoke the last words and closed the book. I don't see that particular expression very often on the faces of other adults, but I saw it every day as a classroom teacher, and I see it now constantly with my four-year-old son. The pride I saw in Jane's face that day had nothing to do with pleasing me or satisfying her parents. It was the exultant feeling of accomplishment that shines through a child when she has amazed herself. She had met her own personal challenge, and she was eager to keep on going. After that day with Jane, I would have many similar moments with other students over the years, all of which I still cherish. I taught in early elementary classrooms for six years before I made the hard decision to leave my job in order to stay at home with my own young child. It wasn't that I actually wanted to stop teaching; it was simply that I did not have the capacity to balance the needs of my students with the needs of my son. He was three years old at the time, and while he was making magnificent developmental leaps and bounds, I often felt that I was hardly present (physically or emotionally) for any of them. As it turned out, the timing seemed perfect. To my joy, my little boy was showing signs of what we educators like to call "reading readiness." He had gone from tearing apart board books (which I only half-jokingly referred to as an early appreciation of the written word) to pointing out the letter D in his name to noticing the occasional familiar word on street signs as we walked. In lieu of teaching a classroom of children to read, I decided that I would throw myself fully into teaching the same skills to my son. Formal reading instruction would begin at age five, I determined. Looking back, I see how silly my assumptions were; I regarded my son only as a student, who would surely follow the Common Core timeline of literacy learning, who would readily be molded by me—as if I had any control. Today, he sits upright, at full attention on our living room couch, a picture book in his hands. The paperback is too large for him, and as I look across the room, the book hides most of his head. But I hear him. He is whispering aloud the words to himself. I am writing at my desk, supposedly, but my attention is focused on him, on the story coming haltingly from his mouth. I see the determination in his eyes. He is four years old, and he is reading with the fluency of a much older child. How full of hubris I was, to think that there would be a particular day of my own choosing when I would sit him down with a book and say, "This is the day I have decided to give you the gift of reading." I didn't teach him to read; he couldn't wait five long years for that, so he taught himself. I recall the excitement I felt for my students once they began to read, as well as my own personal sense of a job well done. Even though I knew better, because all children learn and progress differently, there was a part of me that saw a child reading as an indicator of my educational proficiency: "You see? I'm a good teacher, because my students are learning from me." I'm not certain of how much credit I can take for my son's reading aptitude. It did not derive from phonics lessons and worksheets, but I wonder if he absorbed the message that reading is a wondrous thing. Surely a house full of books, two parents reading to themselves (and him) every night, and regular storytelling influenced his eagerness to read. I am terrifically proud of my little reader, and I certainly am a bit pleased with myself that I have managed, somehow, to raise a boy who, thus far, is initiating his own learning. Other, unexpected feelings are at play, however. Becoming a mother has introduced—and reintroduced—a range of emotions which often leave me befuddled. You see, I envy him. He has just begun to tread a path which I have walked my entire life, and which I continue to follow, lovingly: the journey of a reader. I envy those first spellbound steps and the excitement of a beginning. The early years of literary discovery will be the most thrilling for him, and will stay with him forever. My relationship with the written word has never been a complicated one. From the time I was six years old, I considered myself both a reader and a writer. 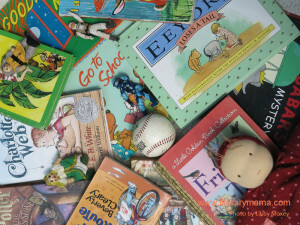 I was the little girl at the school library stacking heavy books on the checkout table to take home with me, the little girl writing overly verbose stories about the inner lives of her cats, scribbled in crayon on thick construction paper. And now my son is, in many ways, the same child I once was. My heart warms at the thought of our bookish bond growing over the years, of sharing a love of words and stories. Indeed, books already are a staple of our time together. I read everything I can to him, and my husband does as well. Even with books that I am reading for my own pleasure, I will read aloud age-appropriate excerpts to my son. He eats it up. At the end of the day, he knows he can postpone bedtime indefinitely by asking for "just one more story." It's almost impossible to deny him that, even if another book is the last thing he needs. Without a doubt, his love of reading fills me with happiness. Mostly. I suppose the strange envy—or is it jealousy?—I feel is a consequence of my own very happy reading memories. My childhood bedroom held three bookshelves full of paperback books, and I can recall myself running my finger over the neatly lined up spines of every single Babysitters' Club book I owned. I remember crying over one of the American Girl books, completely confused by my own tears. And how could an avid Harry Potter fan forget the first time she closed the first book of the series, hungry for more of the world between those covers? "Oh, the adventures you're about to have. And, oh, the adventures I have had, never to experience again." Certainly I would like to feel the dizzy wonder of discovering Judy Blume once more, or that moment of epiphany when I saw my own personality quirks reflected back by Little Women. Perhaps facing these feelings is good practice for the future, when my children will bring home their partners to Thanksgiving dinner or excitedly announce their fascinating internships. I'm not terribly old, although certain seasons of my life have passed. I've come to peace with that fact in relation to other areas, but I'm only now realizing that there are seasons to being a reader as well. When I see my son choose a new book from the library, or sit and read the same well-worn book every day for a month, I sometimes feel a pang of sadness at the reminder that I will never walk the first steps of this road again. Despite the tinge of envy I feel, I am also elated for him because he has ahead of him a lifetime of literary relationships to forge. He has an ever-growing list of favorite characters to fall in love with. There will be countless enthralling sagas in which to lose himself, dictionaries full of beautiful language for him to weave into his own stories, entire worlds for him to discover. My son has already opened countless doors for himself, and he cannot even begin to grasp the magnitude of the journey he has embarked upon. I remind myself, though, that we are on this path together. I can anticipate where a shared love of books will take us: the conversations deconstructing Lord of the Rings, the field trips to new independent bookstores, the excitement of rereading my old favorites with him, the time when he will be able to share his own book recommendations with me. In fact, that has already begun. "This was one of my favorite books when I was your age," I tell him. "I found this picture book at the library, and thought you might like it." "Mama, did you think that book was silly?" he earnestly asks. "Will you pick a book to read to me tonight?" I ask him. True, there are moments when I wish I could go back to being a young new reader myself. But instead of dwelling in the past, I can choose to embrace the pleasures of reading in maturity. My life would be no life at all without books, and I can see my son uttering the same sentiment at my age. I know that someday, when the timing is right, I will find myself in an elementary classroom again. I want to keep teaching children to read; there is joy in reliving vicariously that early literary experience day after day, year after year. On reflection, I don't believe I ever felt envious of my students once they picked up the reins of reading. But I was not their mother. I could guess that some students would become more serious readers, but the scope of my experience with them was still limited. But my child—I do know him, and I see so much of myself in him, so much of the child I once was. As he grows up, I relive elements of my own childhood. There is mourning there, a sadness at having moved on, perhaps even a sadness at knowing that his childhood will all too soon come to an end as well. Yet the books we read together keep us both tethered to the realm of magical childhood. For all that is behind me as a reader, I have the electrifying sense that what is to come may be even more momentous. There is a special connection that book lovers share; affectionate understanding in the mutual appreciation of a brand new book, its pages crisp and white, an old library with hidden secrets amongst the stacks. Book lovers speak a language all our own. It's a joyous surprise of motherhood to find myself speaking that language with my son. Christie Megill is a children’s book writer, literacy advocate, and homeschooling mother. She is a former elementary school teacher with a speciality in early literacy and a BA in English Literature from Fordham University. Her writing has appeared in BonBon Break, Scary Mommy and Playful Learning. She lives on Whidbey Island with her husband and two young children.